On a recent trip to South Africa, I had the amazing opportunity to see Cape Parrots in the wild. I also got to meet Sanjo from the Cape Parrot project to learn more about the project and about the wild Cape Parrots. The South African Cape Parrots are restricted to a fairly small habitat, the subtropical cloud forests of the eastern Cape. It is a dense wet forest environment with frequent mist and rainfall. The temperatures are cooler because of the 3,000ft+ elevation. It can be fairly warm in the summer but in winter time, these birds can be dealing with below freezing conditions. This is why it should be no surprise that it was very difficult to get to see them. Not only did we have to travel to a fairly remote part of South Africa, that was only the beginning! Their population is very small and they are quite hard to find. They are considered quite large for an African Parrot, however, they are still a medium parrot at best when you compare with Cockatoos and Macaws. 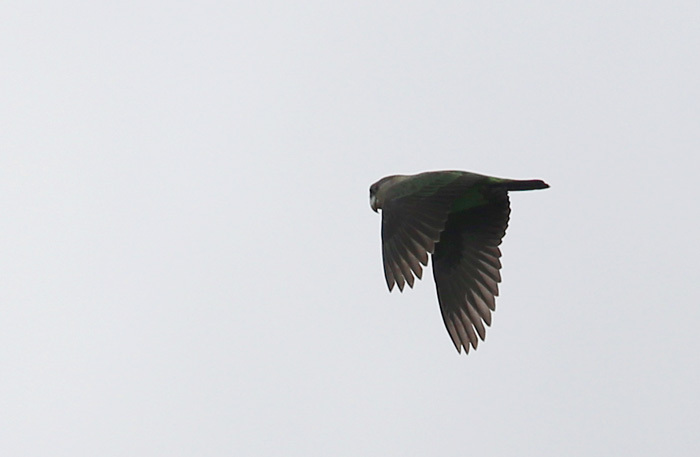 Green parrot, green trees, misty forest, and a broad range makes them a tremendous challenge to see. They travel for many miles from roosting to feeding sites so there is only a brief span of time when you can see them where they live. At night they are sleeping and in the day time they are spread out feeding. Only in the early hours of morning and at dusk can you catch a glimpse of them heading out and coming back. With the help of Sanjo from the Cape Parrot Project, we set out early in the morning looking for the birds. We woke up and were out by 5AM to catch them as the sun was rising. Unfortunately a thick fog blanketed the entire area. We drove to higher ground to break out of the fog but still could not find them. We walked around several places known to be visited by Capes before we so much as heard a single call from them. 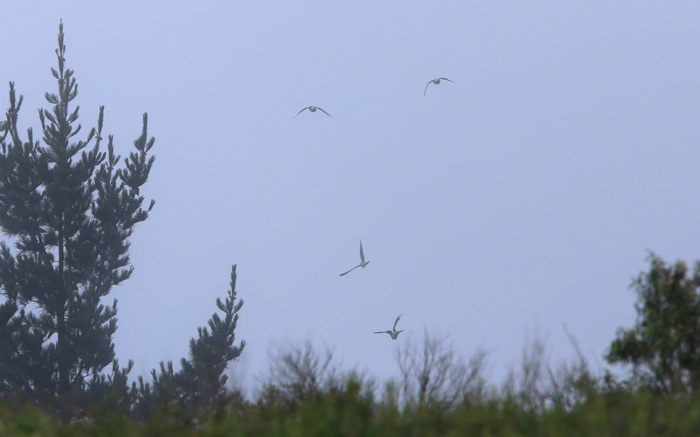 Following the calls we saw a small group flying and followed them to the tree they finally landed in. We were lucky to be standing in enough of a clearing to even see where they went. Standing in the forest, it would be impossible to track them. It was a joy to watch flocks of Capes flying and to listen to their familiar calls. The beautiful South African Cape Parrots are truly a sight to behold. But finding and seeing them is extremely tricky. Although they stay in groups, they aren't quite a "flock bird." The trees they land on are high and dense. They aren't ostentatious like Conures and other parakeets I've seen in the wild. Nor are they shy like Senegal Parrots and other small Poicephalus. They really do fall somewhere in between. They are certainly more shy and prone to spook than other types of parrots but at the same time, they are the most courageous of the Poicephalus genus. What does that mean? Well, in regards to how close you can approach them or how predictable their movements are, that is how I rank them to be somewhere in between. It was not impossible to get footage of them but it was quite difficult. You have to be very patient, know where to look, and be even more patient still. It took us hours of observation across two days to get to spend just about 15 minutes in their majestic presence. And then, as quickly as they had come, they were gone. It was so exciting to watch the resemblance of these wild Cape Parrot to Truman, my pet Cape Parrot at home. I got to see preening, calling, and playing behavior in the wild Capes that was essentially identical to the behavior that Truman exhibits. It was just so familiar even though I had never seen a South African Cape in person before. What is the difference between Truman and the Cape Parrots in South Africa? Truman is a different subspecies. He is definitely not the Poicephalus robustus robustus subspecies. He is one of the other two and most likely the Brown-Necked subspecies (Poicephalus robustus fuscicollis) which is endemic to the semi-rainforests of Sierra Leone region of West Africa. You will notice in the pictures that Truman's subspecies is a bit larger while the South African Cape Parrots have an olive yellow head. Otherwise, they do look the same. The South African Cape Parrots are extremely rare to find in aviculture or captivity. The ones you find as pets in the US and Europe are of the Brown-Necked Fuscicollis or Grey-Headed Suahelicus subspecies. They are more similar to each other than to the South African Robustus Cape Parrot. We encountered one Robustus Cape at a bird park in Johannesburg and heard that there are a few breeders of them in South Africa. I have yet to see or hear of any Robustus Capes outside of South Africa. There has been research done by South African researchers and the Cape Parrot project to reclassify the South African Cape Parrot (P. r. r.) as a separate species from the two northern subspecies. They hope that by naming it a separate species, it could end up on the endangered species list and receive CITES protection. However, even as of 2016, Bird Life International and the IUCN Redlist, have not accepted there to be sufficient evidence to name them separate species. Heck, the differences between Timneh and Congo Greys or between Jardine's Parrot subspecies are far more significant than between the most distant Capes. The biggest difference between South African Cape Parrots and the other two subspecies are not in their appearance but in their living habits. The South African Capes rely almost religiously on the yellowwood tree. They refuse to nest in anything but natural cavities of the yellowwood tree and they also rely on it for food. Not only do they eat the seeds of the fruit of the yellowwood tree, it has been discovered that properties of the yellowwood fruit help give these birds an immune system boost that helps them battle a beak and feather disease epidemic. Their survival depends on the yellowwood tree for fighting disease as well as for feeding and nesting. Still, regardless of classification, science, politics, or what you call it, the fact that the South African Cape Parrot is critically endangered still stands. There are fewer than 2,000 known South African Parrot Parrots remaining. Deforestation of their peculiar habitat, widespread disease, and some remaining poaching is making their survival questionable. The Cape Parrot Project is performing research to learn more about these birds in order to focus best efforts on their protection. A main focus is replanting yellowwood forests to protect the Capes' natural habitat. 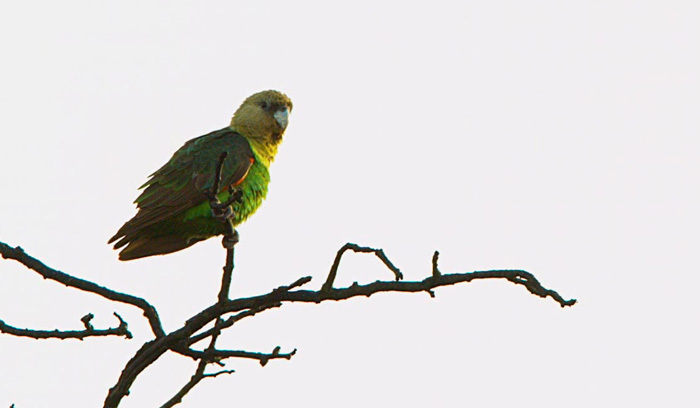 The Cape Parrot project receives funding through donations to the Wild Bird Trust. With all the attention that I have been receiving since Kili's performances on TV, I'd like to take a moment to write about a cause that is very dear to me: parrot rescue. 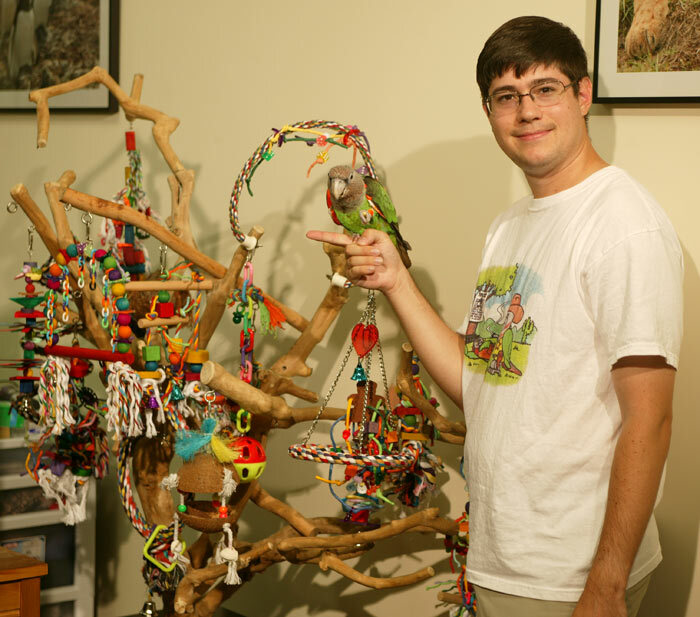 Countless numbers of parrots are being rehomed, released, euthanized, or neglected every year mainly due to the irresponsibility of their owners. Other times it has nothing to do with irresponsibility but unforeseen circumstances. My personal approach is to try to be as responsible of an owner as possible but also to prepare my parrots for unforeseen circumstances so that any changes would be bearable for them. There is one rescue in particular that I believe deserves special attention and I hope can act as a model for other such organizations. I'm talking about Ginger's Parrot Rescue in Phoenix Arizona which specialized in Senegal Parrot rehabilitation. Ginger takes in unwanted Senegal Parrots and turns their life around. Usually these birds end up in rescue because of problems that irresponsible owners caused such as biting, plucking, or screaming. However, Ginger personally works with each bird and prepares it for a new life in a new home. 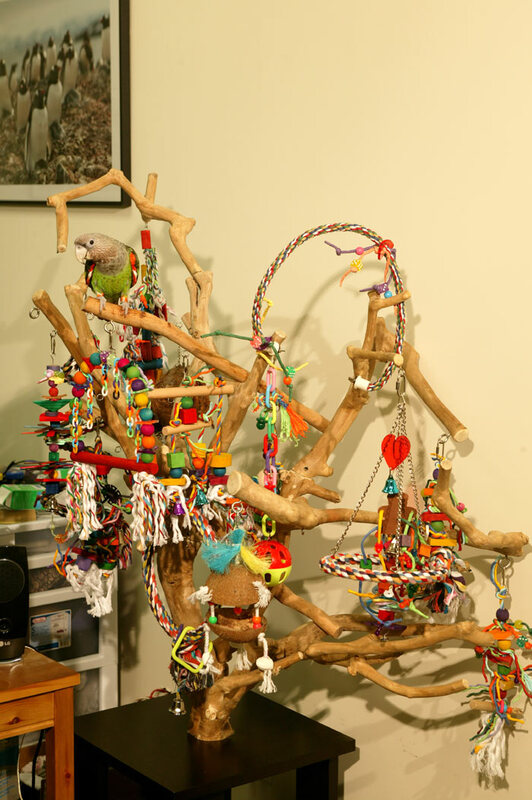 Unlike most typical rescues, she does not simply stick the bird in a cage on display until someone willing comes around to adopt it and take on a whole project. 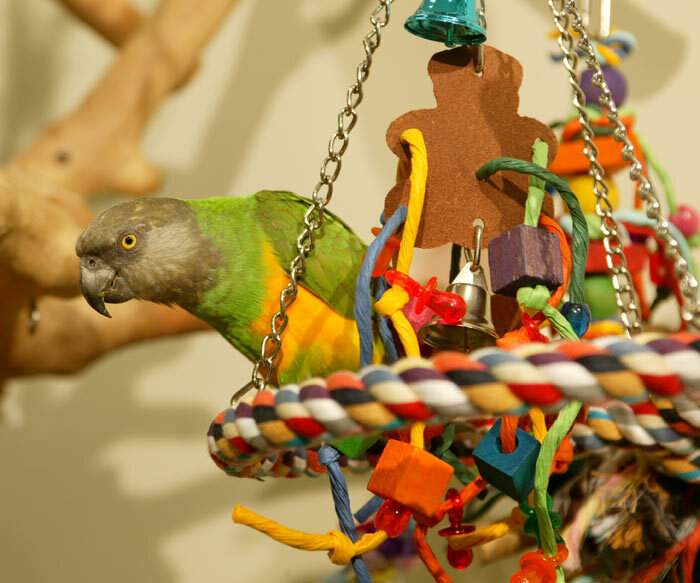 Instead, Ginger applies her refined understanding and experience of Senegal Parrots to erase the bird's troubles and present it as a trouble-free and desirable pet. Most rescues operate on the principle of pity. That is the bird has a terrible past and the rescue hopes to find someone compassionate to take on the bird out of pity. 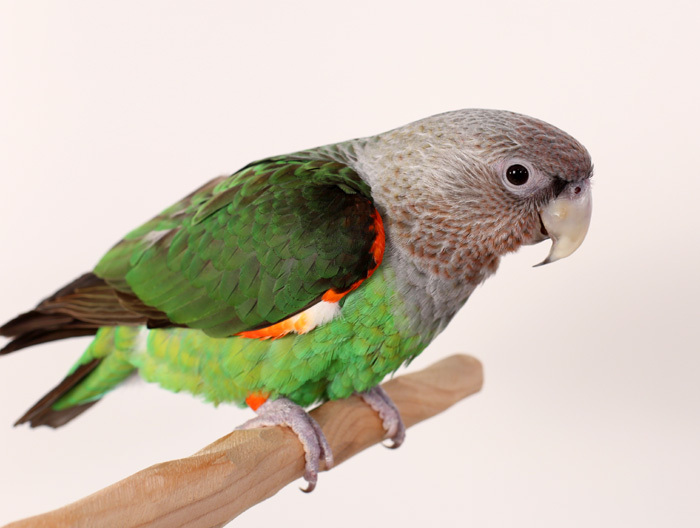 The trouble with this approach is that beginner owners that choose a rescue over a baby parrot in this case are often destined for failure because they are not experienced enough to be able to cope with a difficult rescue bird. On the other hand, the more experienced owners end up reaching their capacity of how many parrots they can keep too quickly for the rescue to be able to continue homing the flood of birds coming in. For these reasons, I think Ginger's approach is more sustainable in the long term. 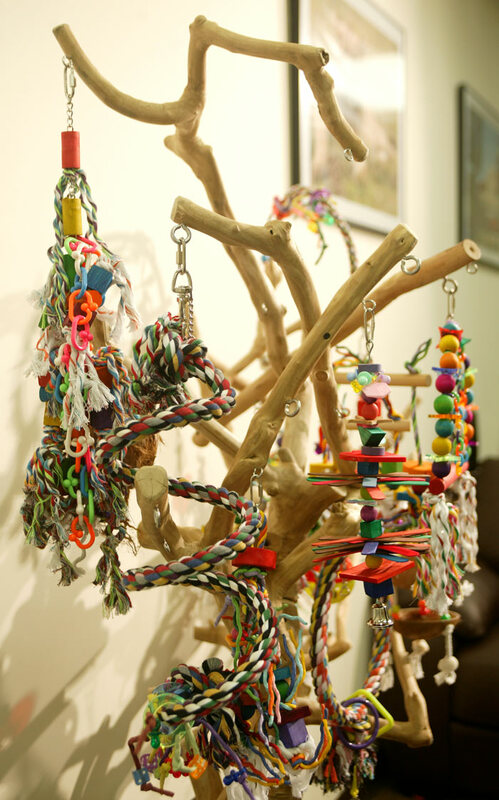 She takes in a limited number of parrots and all of the same species. She exposes them to a flock of similar parrots to learn a suitable way of life. The modeling approach that Ginger employs is very successful. Parrots new to the flock quickly transition to a healthy diet, learn to step up to come out of the cage, and become sociable toward humans. This is a much more effective approach than a person adopting that parrot outright from its originator. You see Ginger has the patience, specific species expertise, and same species flock behind her to ensure success. If someone adopts a problematic rescue parrot directly, the likelihood of failure is substantially higher and only puts the parrot on a tour of rehoming. This type of failure becomes even harder to undo down the line. So by breaking the chain and establishing results with the parrots, Ginger is able to ensure a greater likelihood that the adopters of these parrots will not need to rehome them again due to past problems. By providing "handfed baby from the pet store" quality parrots (or better), Ginger's parrots are competitive against breeder babies. 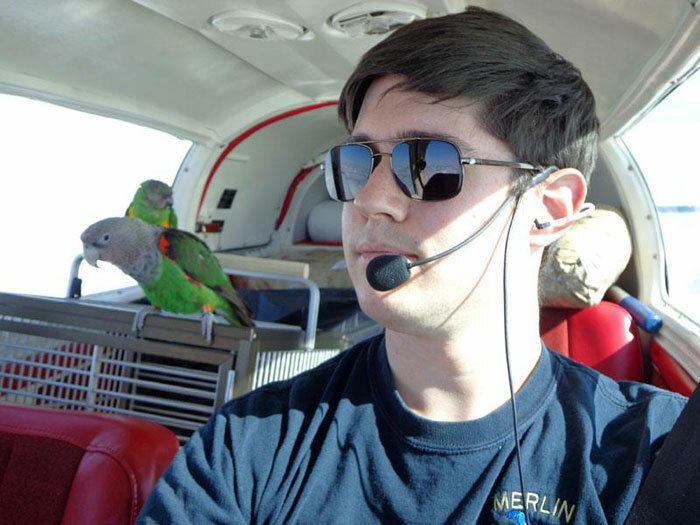 This is the best part of the approach because it provides a realistic rescue option for less experienced parrot owners. Not only does this approach find a home for a parrot that requires one but it also reduces demand for baby parrots. Another novelty of Ginger's approach to adopting out parrots is that she makes extensive measures to socialize the parrots with potential adopters. Adopters need to visit the parrots at the rescue as well as the parrot visiting the adopter at their home. 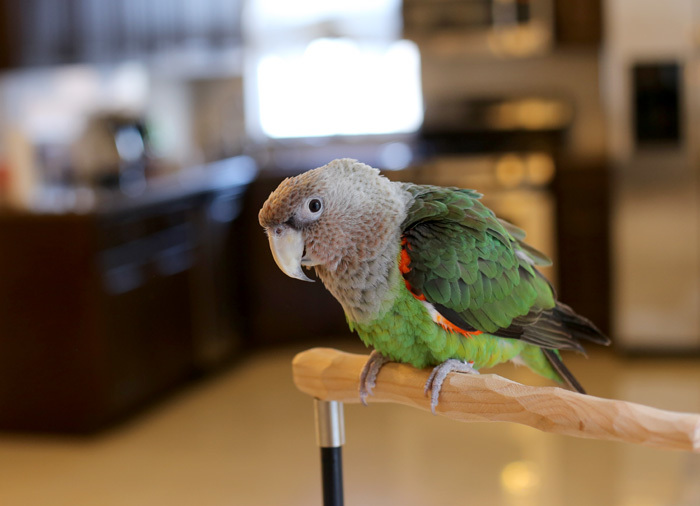 Ginger helps guide interactions between parrot and potential adopter to ensure that everyone has a good experience. 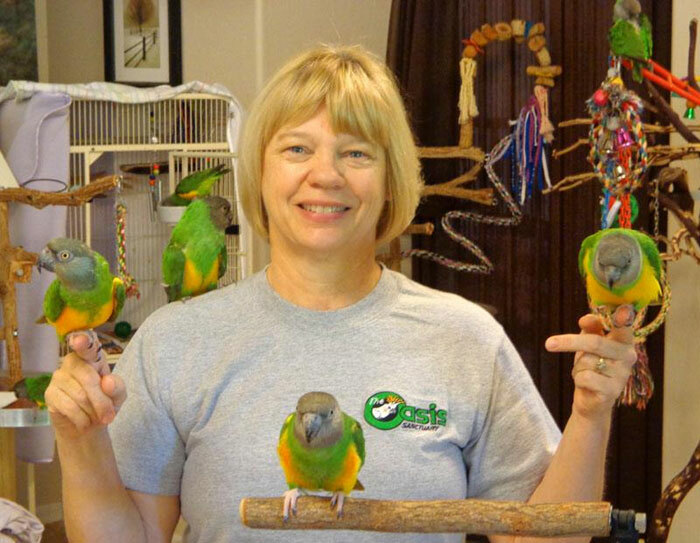 Not only does Ginger work with the parrots but also with adopters when it comes to education. Ginger helps adopters set up a diet, schedule, and daily routine that ensures that parrots remain tame and everyone is happy. I have personally visited Ginger's rescue twice now. 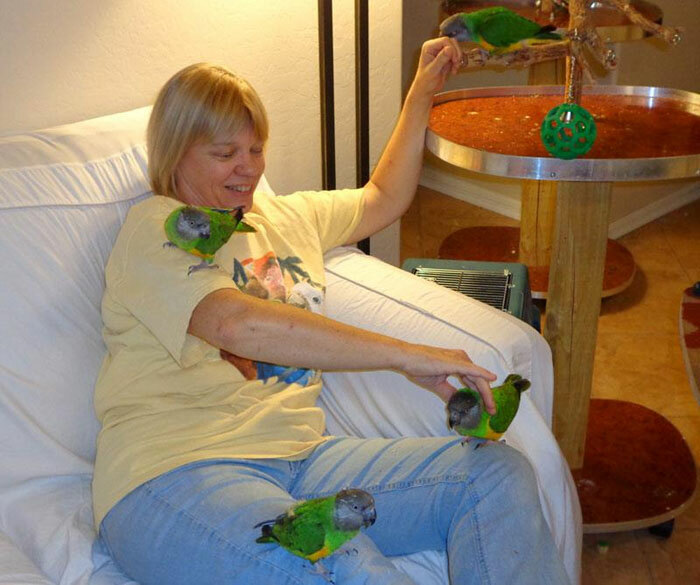 The first time was during my summer stay in Phoenix for the Parrot Wizard Bird Show and Seminar. The second time was recently during my hurricane escape and trip to Chicago. I provided Ginger with a lot of tips and training guidance since my first trip and was thrilled to see a lot of results during the months in between. It was also exciting to see many of the same birds I met last time (although I would prefer if they were already adopted). Neither the first nor second time have I been bit by any of Ginger's parrots. I would just walk into her cage room and take all the birds out one at a time. Almost all of them (except the recently added birds that haven't received enough work yet) would step right up on my hand without biting so I could take them out. I'm not sure if the birds remember me since last time or my approach is successful but I can tell you that it works consistently. I'd like to end this article by describing 3 ways you can help Gingers Parrots. The best thing you can do is adopt a parrot. Don't adopt a parrot you don't need/want. However, if you are looking for a Senegal Parrot baby, consider adopting a Senegal from Gingers Parrots instead. Her older parrots are as friendly and easy going as a baby except they have these traits long term as opposed to the baby that stays sweet until it matures. If you're not located in the Phoenix area or not in the position to adopt, another great way to help is to donate. The best way to donate is to sponsor a parrot! 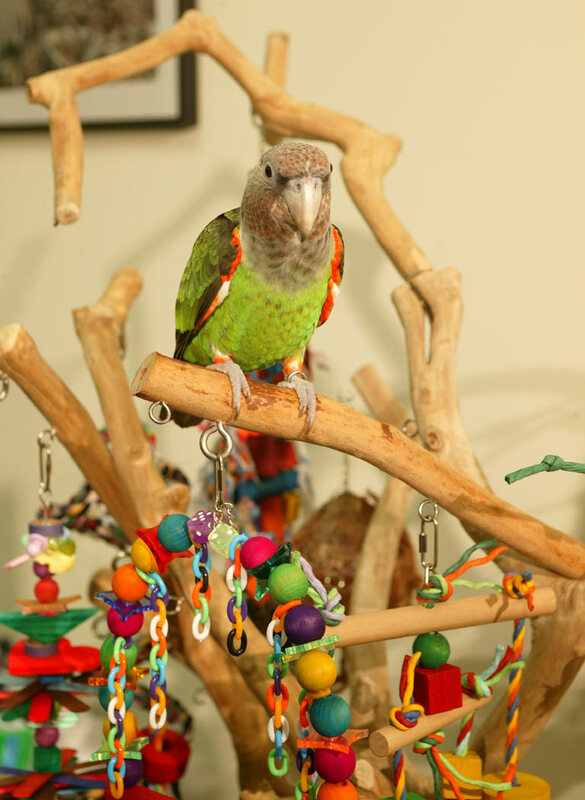 This is a small monthly amount that will help ensure that an individual parrot can get the best possible food, toys, and supplies at the rescue until it is adopted. You will be kept informed about the bird through photos and videos. Alternately you can make a one time donation of any amount. Every little bit helps. I'm sure the rescue takes cage/supply donations as well (call/email Ginger if you want to send supplies). Finally, there is an easy way that absolutely anyone can help is by spreading the word. The more people that know that this rescue exists, the better the chances that an adopter or donor can participate. So even if you cannot adopt or donate, please share the link to the website and facebook page with all the parrot lovers you know. Nearly a year ago I took a trip through West Africa and got to visit the native habitats of Senegal Parrots, Rose Ringed Parakeets, and Brown Necked Cape Parrots. 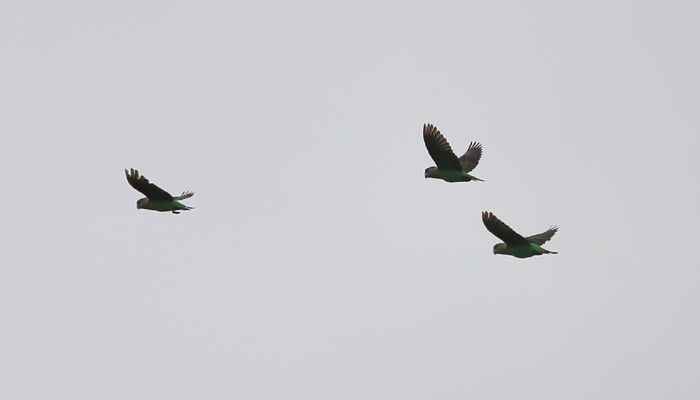 I've already posted footage of the limited sightings I've made of wild parrots during the trip. Unfortunately most of my contact with parrots during the trip was not with them in the wild. 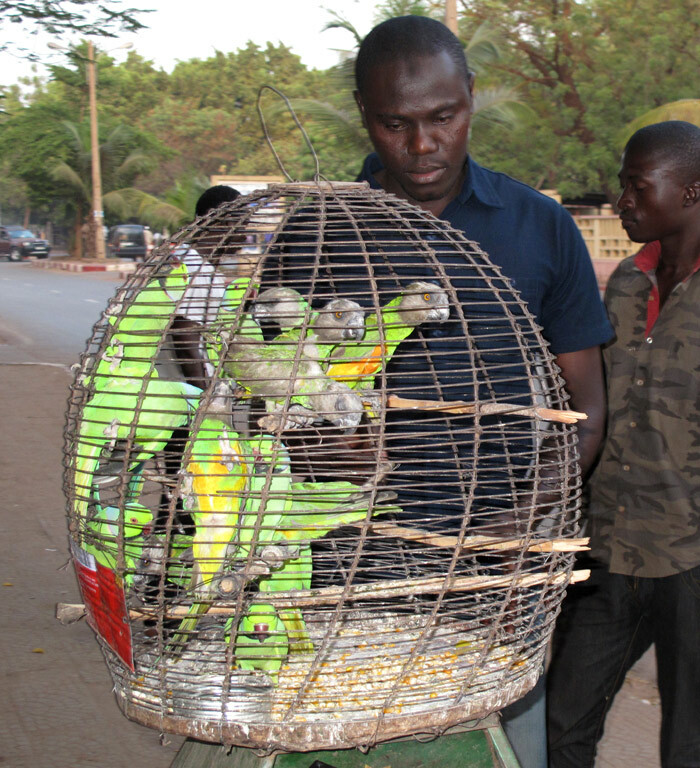 The only Senegal Parrots I saw in Senegal were a pair of wild caughts for sale at the side of a road in the capital city of Dakar. As we were driving through heavy traffic, the seller of these parrots walked up to the car sticking the cage up to the window offering both of them with cage for 20 euros (approximately $30 USD). Before reading/looking further I must warn you that images, videos, and descriptions are very graphic and you may well not want to see/read this. If seeing images of animals suffering is unbearable to you, stop here. You won't regret missing what I experienced. People have been asking me why I did not buy them to keep or release. First of all, I was traveling on vacation with no interest in actually buying a parrot. Taking them out of the country may be problematic but bringing them into the US would be absolutely illegal. Buying the parrots to free them would first off encourage capture of more parrots for sale. Since the parrots were likely caged as such for a long time with no ability to exercise, they were most likely malnourished with atrophied muscles. They would not be able to evade predators or humans if freed and most likely eaten or captured for sale again. As I explain in parrot training, it is important not to positively reinforce unwanted behavior. And in this case paying for the capture of wild parrots would simply encourage them to do more of this. For all of these reasons I did not do any of this and (besides recording) simply ignored the seller by not offering to pay. Those two parrots are doomed no matter what. They are doomed if they get sold, doomed if they aren't sold, and just as much if they are released. The best thing I can do is not to be a participant in this industry. The seller was bargaining insistently trying to get us to buy them so to ward him off we asked to see the documents for the parrots which immediately changed his desire to try to push us to buy. During the trip I spotted wild caught Senegal Parrots and Rose Ringed Parakeets held captive on several further occasions including in a small aviary in a hotel garden. 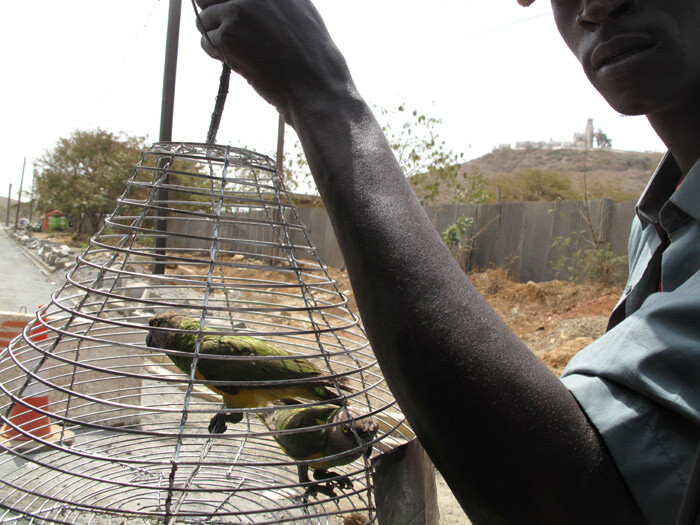 Some of the wildlife reserves had cages with confiscated wild caught parrots that they were rehabilitating for release back into the wild. I visited the forests of Sierra Leone to which Cape Parrots (Poicephalus Robustus Fuscicollis) are endemic but did not have the chance to see any. The local people have different names for the parrots so it was difficult to explain. But when I showed a picture of Truman, rather than saying where to see them in the wild, they said you can find those for sale on the market from time to time. The Cape Parrots are definitely far less common than the Senegal Parrots. On the other hand, the Rose Ringed Parakeets seem quite plentiful. 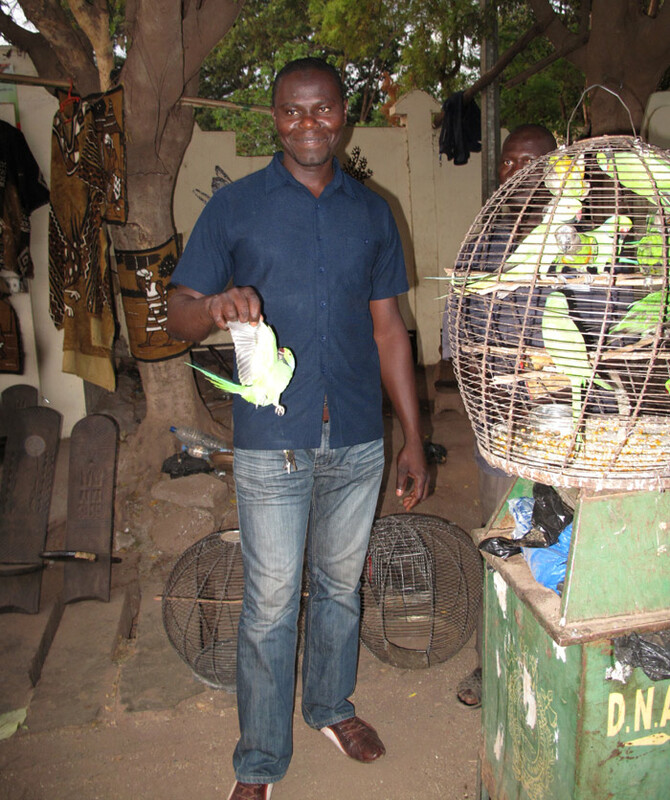 During the last segment of my trip in Bomako Mali, I was taken to see the local parrot market. Scattered on the side of the street under cover of trees were about a dozen vendors and many cages. At least as many other kinds of local birds were offered as parrots. Parrots came in two varieties: Rose Ringed Parakeets (Psittacula krameri) and Senegal Parrots (Poicephalus Senegalus). Atop a garbage pail was a small round cage housing nearly 20 parrots and parakeets. The condition of the cage was so crammed that some of the parrots had to cling to the cage bars or stand on top of other birds. The poor condition of the parrots was evident through plucked feathers, missing eyes, missing limbs, and weak stance. Tossed on the bottom of the cage amidst feces was chicken feed mainly consisting of corn. Despite their tragic lives, the Senegal Parrots still gave off that typical parrot curiosity and watched me as I approached. Rose Ringed Parakeets were available in abundance and very cheap. The seller offered a pair of them for $15 including the cage. The Senegal Parrots were just a bit more expensive at $10 each. 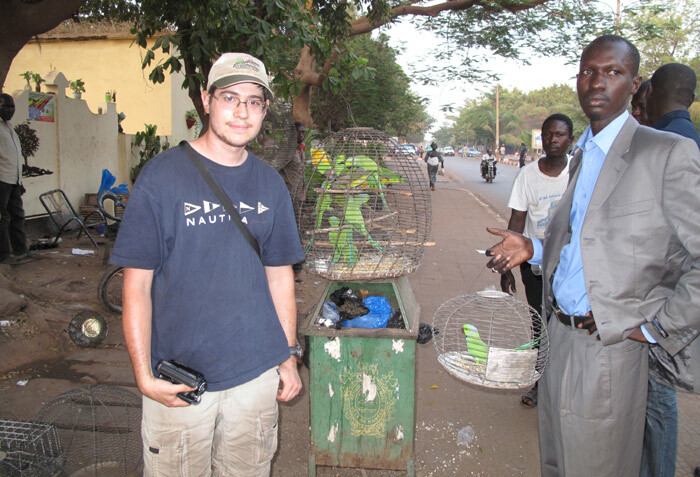 Most of the parrots were not captured in Bomako but brought in from Segou, Mali. How shocked the sellers would be to know that the parrots they are selling for $5-$10 a piece often carry a price tag of as much as $600 in the US. Of course there's no comparison; the American ones are carefully domestically bred and raised while those were snatched from the wild. The market parrots were mostly being sold to local people (often as decorations for offices and hotels) but some to smugglers to be taken abroad. To show a parrot to perspective customers, the vendor opens a small door on the cage and reaches his arm in. The parrots immediately go into a frenzy and start jumping over each other to try to evade the approaching hand. Meanwhile he starts grabbing and pulling by their wings until they can no longer hold on and fall into his reach. I alone cannot do anything about the situation. Buying, releasing, arguing, or anything else would not have solved anything. However, I feel that by sharing this with everyone, people may develop a differing view. Whether you travel to Africa or some other place with native parrots for sale, do not under any circumstances buy them (whether to keep or release). Discourage others from buying wlid caught parrots as well. Adopt parrots from rescues, other owners, or buy parrots from domestic breeders. Unfortunately there is little that can be done about the capture of wild caught parrots for sale to locals. However, as long as foreign trafficking of wild caught parrots ceases, the populations in most cases should be sustainable. It is not an easy problem to solve but it's easy not to be a part of it. And finally, just remember to take good care of your own birds and help out birds at rescues so that our descendants of those wild caught parrots can have a better life.